When scheduled events don’t go as planned, something else often good comes about. I suppose this is like creating ikebana arrangements – what you plan may not always work to your specifications because you are working with fresh plant material but you could discover something else, which is just and possibly more exciting. I planned to visit Wake where there is a famous Fuji (wisteria) tunnel only to be told by the station master and the taxi driver the flowers hadn’t started, I was early by about a week. What a shame because I believe it is a sight to be seen. Not to be phased by this disappointment I was soon rewarded with my visit to Korakuen Garden and Okayama Castle. I have heard of the expression Hana Fubuki (petal blizzard) but never really seen it. 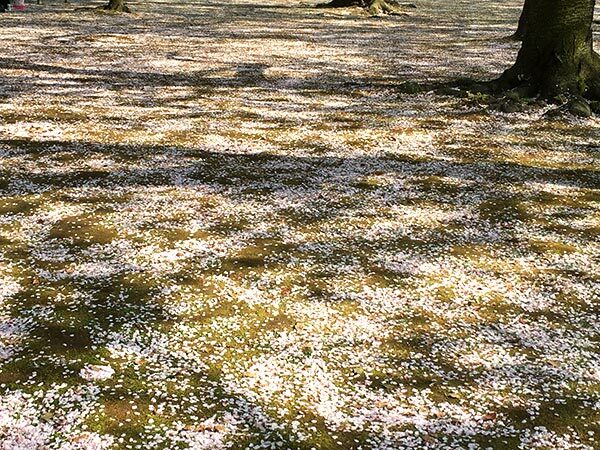 The name is very apt because it is very similar to snow falling in a strong wind, the air is pink with fluttering petals from the Sakura trees. 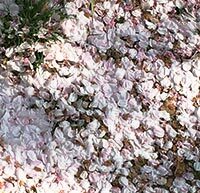 This results in the ground looking as if it is covered in pink snow, certainly a sight to behold, it actually takes your breath away.